1001 Fruitwood Court, LaGrange, KY 40031 is a eye catching four bedroom home positioned on a spacious manicured lot in the estate section of Cherrywood. The front foyer welcomes visitors with hardwood flooring, a stairway to the upper floor adorned with iron balusters, and arched entrances to the Great Room and Formal Dining Room. 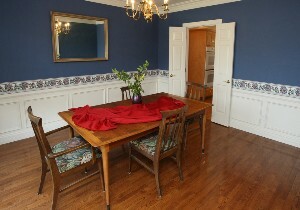 The Formal Dining Room features a lovely chair rail and crown molding. 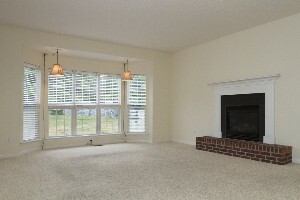 The Great Room is an open space with a gas fireplace, crown molding, and new carpeting. The Eat-In Kitchen offers a good sized dining area, an island with pendant lighting, hardwood floor, and abundant cabinet space. A Half Bath with hardwood flooring and a walk-in Laundry Room with wall shelving and tile floor are also positioned on the first floor. The second floor showcases a game room, which is a fabulous spot for family movie nights! The Master Suite is accented by crown molding and a tray ceiling and connects to a nice Master Bath with a shower, tub, dual vanity, and spacious walk-in closet. The three secondary bedrooms are good sized and located conveniently to another Full Bath. 1001 Fruitwood Court, LaGrange, KY 40031 has a huge unfinished basement with a full sized window for natural light. The basement is not a walk-out but offers loads of additional space including a pre-plumbed area for an additional bathroom. The home has a fully fenced, newly sodded Back Yard and attractive patio area. Several recent updates to the home include upgraded carpeting, fresh paint, hardwood flooring, new doors and hardware, and a security system! For more information CLICK HERE. Interested in building? 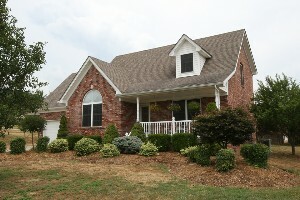 Build the home of your dreams at 16 Alyssa Brooke Drive, Shepherdsville, KY 40165 in Winding Creek! The property offers over 5 acres of beautiful private land. The lot is partially wooded with a peaceful creek that meanders through the back portion of the property. A home with a walk-out basement would be an excellent fit! 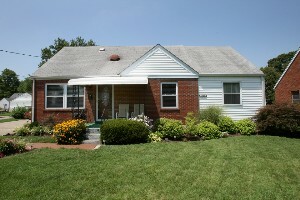 4604 Kiefer Road, Louisville, KY 40216 is captivating and absolutely move in ready! Step into a tastefully decorated Living Room and then move into the warm Family Room with upgraded light fixture and access to the back Deck. 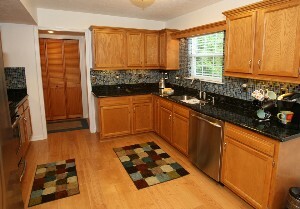 The Eat-In Kitchen features stainless appliances, granite counters, and glass tile back splash. The sizeable master bedroom contains a Master Bath with marble flooring, separate vanities, and walk-in closet. Another good sized room containing a private closet could easily function as a private office or additional bedroom. A walk in Laundry and another Full Bath are also positioned on the first floor. Two nice bedrooms and a unique loft comprise the second floor of the home. 4604 Kiefer Road, Louisville, KY 40216 has a lovely landscaped back yard with a large deck, an oversized garage, and full chain link fence. 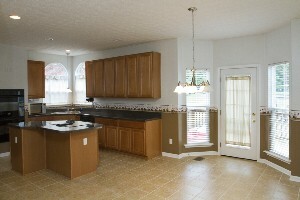 Updates include light fixtures, fresh paint, doors, and new appliances. The AC, water heater, duct work, and furnace were replaced in 2006. The home is completely spotless and full of character. For more information CLICK HERE! 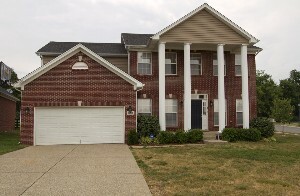 4811 Middlesex Drive, Louisville, KY 40245 is an immaculate Louisville Home located in the Bay Tree subdivision. The front entry features slate flooring and leads into a sizeable Living Room with decorative ceiling light fixture. The Eat-In Kitchen includes glass tile back splash, stainless appliances, and a dining area with access to the back deck. 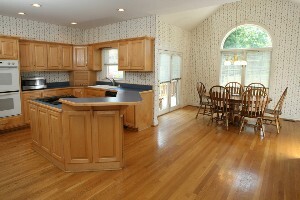 The Kitchen opens to a spacious Family Room with lots of natural light. The first floor half bath showcases an attractive granite topped vanity and tile backsplash. A spacious Master Suite is positioned on the second floor with a beautful Master Bath containing framed mirror, tile floor, wall cabinet, and granite top vanity. 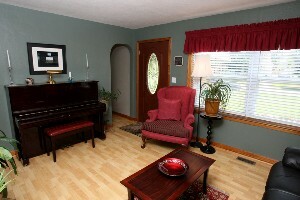 The second floor also houses two other good sized bedrooms, another Full Bath, a sitting room, and a Laundry Room. 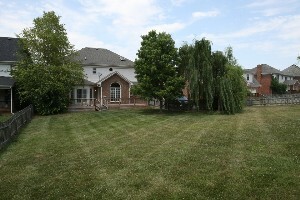 The Back Yard is nicely landscaped with a six zone irrigation system and comfortable Deck. 4811 Middlesex Drive, Louisville, KY 40245 includes a two car attached insulated garage, a home security system, and a back up fire alarm system. The home has received numerous upgrades including new lighting fixtures throughout, new doors and hardware, granite vanity tops, and a new AC and furnace in 2010. The house is located just minutes from shopping and dining in Springhurst and has easy access to the expressway. For more information CLICK HERE! 1616 Overstreet Lane, La Grange, KY 40031 MLS#1337338 is a great 3 bedroom brick ranch sitting on 10.5 acres of rolling land. The home offers peaceful living and lots of space. The front porch enters into an open Living and Dining Room with neutral decor. 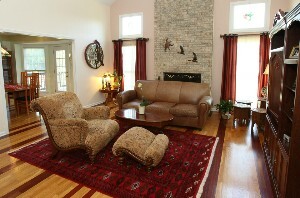 The Family Room is large with a rustic floor to ceiling brick fireplace and opens to the Eat-In Kitchen. 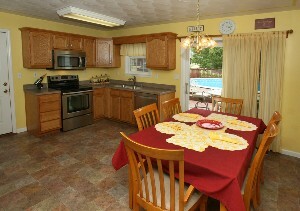 The Kitchen includes a nice dining area and plenty of cabinetry. The large Master Bedroom contains a good sized closet and can easily fit a sizeable bedroom set. Two secondary Bedrooms, a Full Bath, and a walk- in Laundry Room complete the first floor. New owners will love the walk-out Basement! 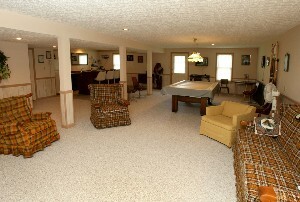 The Basement Family room is wonderful for entertaining and gaming and includes a built in bar with storage and sink. The Basement also houses another Full Bath. A covered back deck provides a lovely view of the property. There is a two car attached garage as well as a large outbuilding with extra garage bay. The outbuilding has electric and water running to it and is a workman's dream! 1616 Overstreet Lane, La Grange, KY 40031 MLS#1337338 offers a quiet setting and lots of room to grow. The home is conveniently located to Oldham County Schools and only minutes from downtown La Grange Ky. For more information CLICK HERE! 144 Branch Court, Shepherdsville, KY 40165 is a 3 bed, 2 and 1/2 bath home positioned on a secluded dead-end street. The eye catching front porch draws in visitors and enhances the curb appeal. Enter into a large Living Room featuring neutral decor, ceiling fan, and a rounded window. The Eat In Kitchen offers lots of cabinetry, a brushed ceiling finish, spacious dining area, and new stainless appliances! The first floor Master Bedroom is very convenient and contains a huge walk in closet and great Master Bath with dual vanity. There is also a tiled walk-in laundry room and a half bathroom on the first floor of the home. 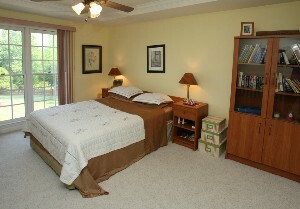 Two very large secondary bedrooms are located on the second floor and one contains a walk in closet. The two rooms are connected by a multipurpose room that could be used as a playroom, office, or entertainment space. A huge storage room and Full Bath are also locted on the second story. 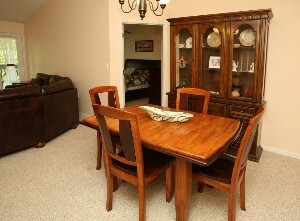 The home has recently received new carpeting throughout, fresh paint, and a new water heater. Cleaning is pain free with the wonderful central vacuum system! Another wonderful addition is the new roof installed in July of 2012! 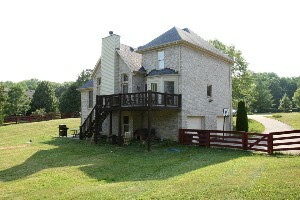 144 Branch Court, Shepherdsville, KY 40165 offers a fabulous backyard retreat! 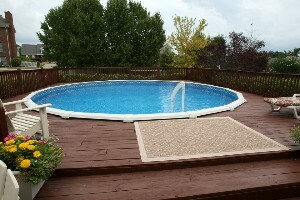 There is a spacious deck with a lovely above ground pool surrounded by hedges for privacy. The yard space beyond the deck is great for outdoor games and parties. The deck was just restained and the pool has a new liner, pump, and filter. What a treat! 10419 Venado Drive, Louisville, KY 40291 MLS#1336711 is the perfect family home nestled in Grey Oaks Estates. The home has an amazing floor plan with four bedrooms, four and a half baths, and a two car garage! 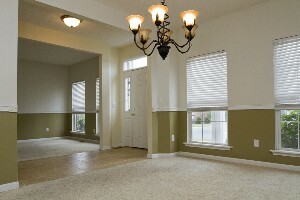 The front Foyer opens to both the Formal Dining Room and the Living Room. Both rooms contain lovely lighting fixtures, windows for natural light, and a custom chair rail. A beautiful bay window accents the Family Room along with a fireplace and raised brick hearth. The Eat-In Kitchen includes plentiful counter and cabinet space, a pantry, built in desk, tile flooring, black appliances, and a large dining area. The first floor also features a half bath and a walk-in laundry room. The second floor houses The Master Suite along with three spacious secondary bedrooms. The Master Suite contains a huge walk-in closet, sitting area, and secluded Master Bath with shower, double vanity, and relaxing jacuzzi tub. One of the secondary bedrooms has its own private bathroom and the other two bedrooms are separated by a Jack-and-Jill Bath. 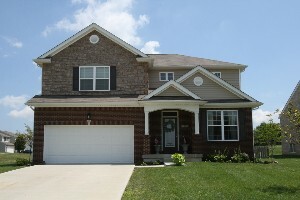 10419 Venado Drive, Louisville, KY 40291 MLS#1336711 has a fully finished basement with a Den, Family Room, and another Full Bathroom. The space underneath the stairway has been decorated as an adorable children's hide out. The Family Room is already set up to accommodate a bar area in the future. The Back Yard has a nice deck and is partially fenced. What a spectacular Louisville home! For more information CLICK HERE! The Lynn Thomas team invites you to join us this Sunday July 15th from 2:00-4:00pm at 1202 Pickings Place #204 in Middletown! Come and see this immaculate 2 bedroom unit in a desirable location. 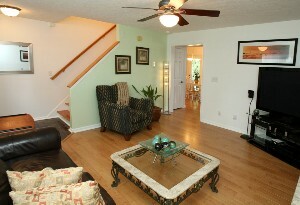 The unit is located very close to the clubhouse with fitness center, in ground swimming pool, and tennis court! You will love the easy access to dining and shopping combined with exterior maintenance and security! Please join the Lynn Thomas team this Sunday July 15th from 2:00-4:00pm at 14108 Beckley Trace in the Beckley Woods neighborhood! This amazing 4 bedroom 2 and a half bath home has been completely renovated with fresh paint throughout, gorgeous oak hardwood floors, stainless appliances, new washer and dryer, new gas furnace, new heat pump, new thermostat, and much much more! Don't miss your chance to see it! For more information CLICK HERE! 1202 Pickings Place #204, Louisville, KY 40243 MLS#1336403 is a terrific two bedroom unit in the Swan Pointe community. 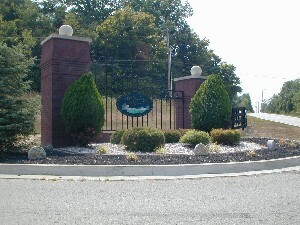 Swan Pointe is located in the Middletown area with spectacular access to shopping and dining along Blankenbaker Parkway as well as easy highway access. This home is tastefully designed with neutral colors and decorative accents. 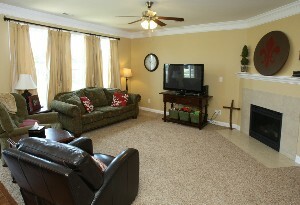 The Living Room is spacious with a lovely fireplace and mantle and plush carpets. A good sized Kitchen looks into the Dining Area and Living Room. The Dining area can easily accommodate a handsome dining set and is lit by a nice chandelier fixture. 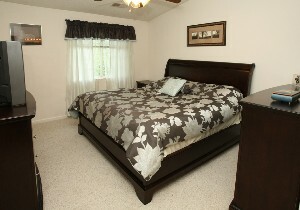 The Master Bedroom is large and includes a private master bath. The secondary bedroom is detailed with a chair rail and white trim work. A great walk-in Laundry Room and another Full Bath complete the floor plan. The Back Deck gives a pleasant view of the grounds and is a relaxing place to enjoy a lemonade on summer days. 1202 Pickings Place #204, Louisville, KY 40243 MLS#1336403 is located very conveniently to the residential clubhouse which houses a fitness center. There is also a terrific in ground pool as well as a tennis court. 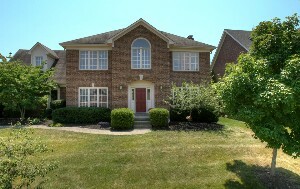 This is a great opportunity to own an immaculate Louisville home in a great area. You will love the peaceful location and appreciate the benefits of exterior maintenance and home security. For more information CLICK HERE! The Lynn Thomas Team would like to invite you to an open house this Sunday. 447 Adrian Ave, Mt. 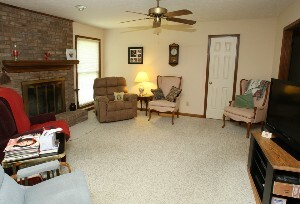 Washington, KY 40047 is a 3 bedroom brick ranch with improvements throughout! The interior is beautifully decorated with custom details. 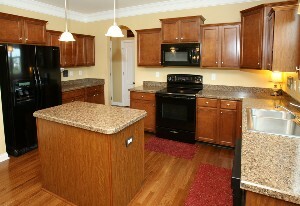 Several upgrades include new AC unit, new thermostat, new hickory hardwood flooring, and multiple kitchen updates! Come and check it out this weekend! Directions: South on Bardstown Rd. Right on HWY 44E. Left into Spalding Station Subdivision (Adrian Ave). 7702 Willow Bend Drive, Crestwood, KY 40014 MLS#1336168 sits on a beautiful waterfront lot in Crestwood. The home has a two car side entry garage, four bedrooms, and two and a half baths. 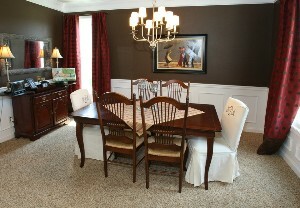 The Formal Dining Room is currently being used as an office space and is highlighted by crown molding and chair rail. The Great Room is absolutely lovely with an arched ceiling, nice lighting fixture, and floor to ceiling brick fireplace. 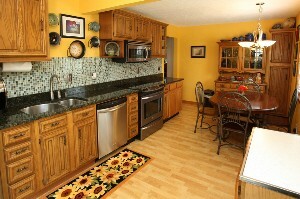 The Eat-In Kitchen has plenty of cabinet space and a good sized dining area. The first floor Master Bedroom is well lit by two floor to ceiling windows and features a tray ceiling. The Master Bedroom also contains a walk in closet and Master Bath with dual vanity and shower. An additional half bath and walk in laundry room are also housed on the first floor. Three spacious bedrooms, a bonus room with built in shelving, and a full bath make up the second floor of the home. 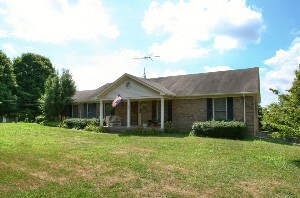 7702 Willow Bend Drive, Crestwood, KY 40014 MLS#1336168 has a huge walk out Basement with a Den and a Family Room. The Basement Family Room has been converted to an excercise space with a spa tub. The Back Yard is fantastic! There is a nice deck, a patio, and lots of space to run and play games. 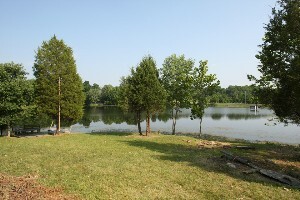 The land backs up to a 14 acre lake and has a private dock for fishing and boating. This is an outdoor enthusiast's dream! Give us a call today if you would like to set up a showing! For more information CLICK HERE! 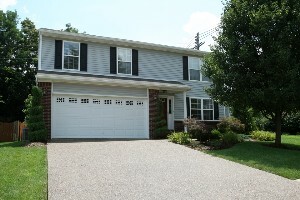 14004 Hickory Ridge Road, Louisville, KY 40245 MLS#1335896 is a 4 bed, 2 full and 2 half bath home in Lake Forest. Beautiful hardwood flooring runs throughout the Front Foyer, Formal Dining Room, Family Room, Living Room, and Eat-In Kitchen. The Formal Dining Room features a chair rail, crown molding, trey ceiling, and a few large windows that bring in lots of natural light. The Living Room is accented by crown molding and opens to the Family Room which contains built in shelving and a brick fire place. 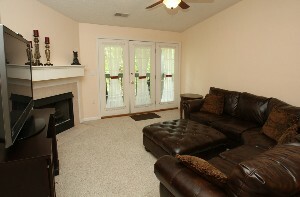 The Family Room also has access to the back deck area. A spacious Eat-In Kitchen also accesses the back deck and includes loads of cabinetry, arched, ceiling, and a kitchen island. The first floor of the home also has a half bath for guests. The Master Suite is quite large with a private office or sitting room, new carpeting, hip vault ceiling, walk-in closet, and Master Bath. A double vanity, soaking tub, and shower complete the Master Bath. All three secondary bedrooms are nicely sized and convenient to another Full Bathroom as well as a second floor Laundry Room with cabinetry and laundry sink. The partially finished Basement offers great additional space with a large Family Room and Half Bath. The unfinished portion of the Basement is fabulous for storage. 14004 Hickory Ridge Road, Louisville, KY 40245 MLS#1335896 also includes a two car rear entry garage and a huge fully fenced yard which is perfect for parties and outdoor fun. For more information CLICK HERE!